By now BMNH R2095 must be the best described, most pored-over 2/3 of a vertebra on the planet. What more can we possibly have to show you? How about this dandy poster for your living room wall, or the entrance to your corporate headquarters? 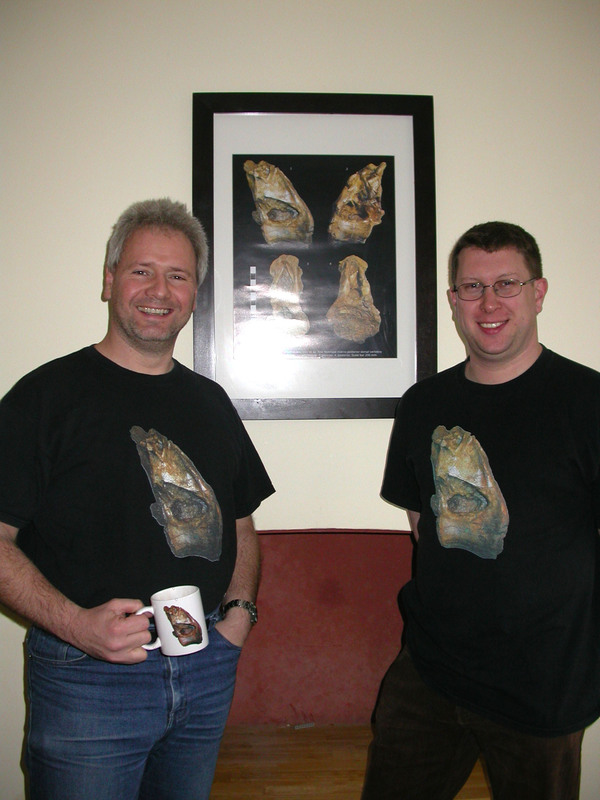 And finally, the happy authors basking in the glory of Good Science. That concludes our coverage of Xenoposeidon week here at SV-POW! Don’t forget to check back next week–and every week–for even more mind-bending morphology, bleeding-edge science, and soul-crushing-uplifting majesty. I’ve ordered a t-shirt. In Xenoposeidon size. It would be cool, though, if the shirt had “SV-POW!” above the bone and “To pneumaticity and beyond!” below it. If it did, I’d order another one. Too bad they don’t do t-shirts with pockets, because then I’d order half a dozen. And it’s not soul-crushing majesty, but soul-uplifting and humbling majesty. Oh I am SO getting a tee shirt! I’m sitting here in the coffee shop snorting and snarfing coffee and making a real @ss out of myself….you guys are really very funny. Ran across another bit of paleontologist fun: Jennifer Clack who named a Carboniferous tetrapod Eucritta melanolimnetes. 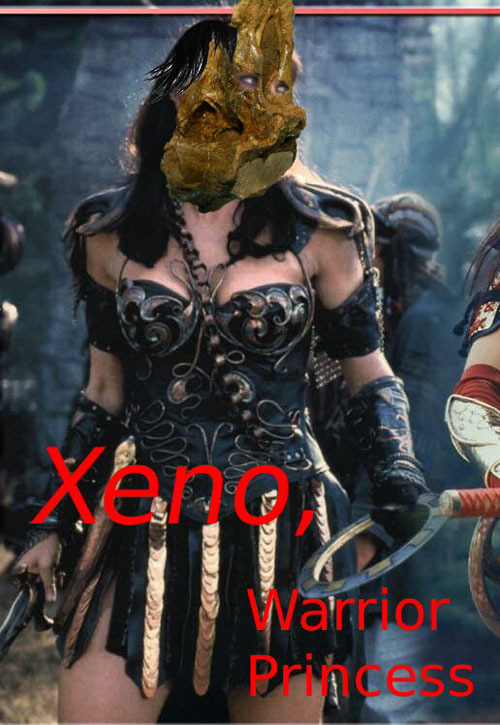 Thanks for the excelent posts on the Xenoposeidon. Thanks, Ville. I’ll check it out post-haste! You guys like that little-known eusauropod, don’tcha? :-) Now that the dissection is over and done, what are your gut feelings as to what group it belongs to? Or are we talking “previously unknown ghost lineage” animal, here? Now that the dissection is over and done, what are your gut feelings as to what group it belongs to? Or are we talking “previously unknown ghost lineage” animal, here? That’s a very good question. The forward-leaning neural arch is something I’ve only seen in Diplodocus and kin. But just about everything else about the vert shouts non-diplodocid. The length of the centrum suggests that it is a titanosauriform of some kind, but that’s not terribly informative by itself even if it is true. So it’s a mess. It’s not that the preserved characters point in no direction; it’s that they point in almost all directions at once. It would be convenient to write it off as unidentifiable chunk-a-saurus if it wasn’t carrying around that big bag of autapomorphies. Which is the other problem, because Xeno really is very, very odd. I’ve known about it for a year or two now and I find that I avoid thinking about it too much, because it frustrates the hell out of me. We need more of it, and until we get that, or somebody finds another representative of its family lineage (however diverse that may have been), we’re stuck. And frankly a little pissed about it. But that comes with the territory. All that’s just my $0.02. I’d be curious to hear what the beast’s two (hetero) daddies have to say on the subject. I like the Taylor Lab logo. As you may have guessed, that poster (including the lab logo) is all Matt’s work. 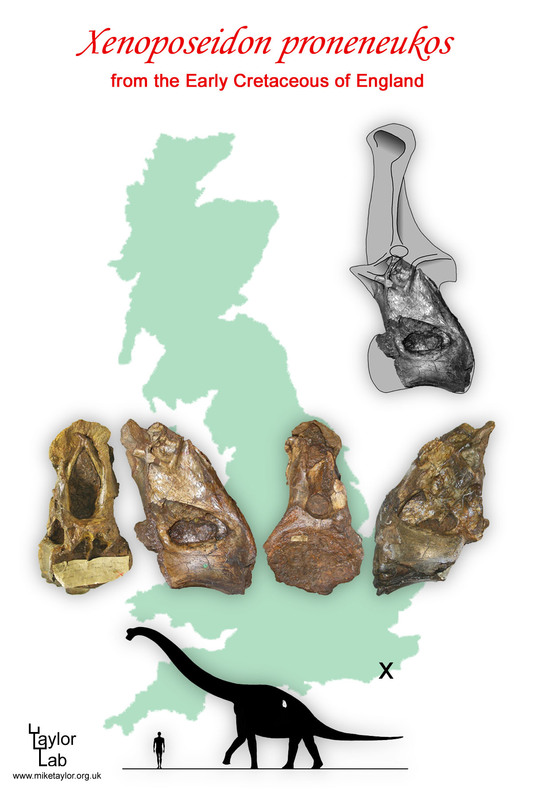 For anyone who didn’t get the reference, he’s alluding to the Majungasaurus poster at http://www.oucom.ohiou.edu/dbms-witmer/images/Majungasaurus_poster_skulls-with-map.jpg, which is based on one of the most absurdly complete and well-preserved dinosaur fossils in the world. Matt’s plan was to extrapolate a similar presentation from a dinosaur that is represented by, uh, somewhat less spectacularly complete remains. To follow up what Matt said, I suppose that we really have now said everything there is to say about Xeno. If we had a “gut feeling” about where in the neosauropod tree it belongs, we would have told you by now, most likely in “Xenoposeidon week, day 3,456″ or similar. So I really think that the only thing to do from here on is wait for someone to find a more complete “xenoposeidonid” specimen (sorry Randy) which will hopefully both give us some nice solid synapomorphies that will allow us to place it, and some more freaky autapomorphies. Really, my dearest wish for what could come out of all the recent publicity would be for hundreds of dedicated but restrained Hastings-area amateur fossil-hunters to swarm all over Ecclesbourne Glen in search of a complete Xeno … and, needless to say, to report any find to the local geological society rather than trying to excavate it themselves! By the way, there is one more specimen in the NHM collection that I think might well belong to Xenoposeidon. It’s almost wholly uninformative, and the referral is pretty tentative, which is why we didn’t mention it in the paper, but if you’re very lucky I might post in on SV-POW! one day. I think blogs would be exactly the place to speculate. For the laymen here, the explanation of why that other possible Xeno specimen isn’t informative and why any referral would be tenuous would itself be informative of how you guys actually do science. And maybe you’ll get lucky and one day be in a pub and some farmer comes up to you and asks if you’re not the guy in the paper with the one dino bone, boasting he’s got dozens just like it in one of his stone walls. And, believe me, I have dreamed of the day when someone finds a complete, articulated Xenoposeidon skeleton. When I was a kid I read a book called ‘Blood’ by a guy who’s first name was Leo (maybe by the time I’m done typing I’ll remember his last name) who worked on blood factors involved in hemophilia. He had worked for a time in a hospital lab back when pregnancy tests involved rabbits. He said that he was sad that a rabbit had to die for these tests but it made him determined that if he had to kill the rabbit, he would study its blood and extract all the information he could (and, as the keeper of the rabbits, he did his best to make their lives pleasant before they had to be killed). I found that very poignant and imagine there must be something similar for paleontologists, trying to extract as much information as possible from such specimens as have survived to come into your hands and knowing, sadly, that it may be all you ever have. I know sometimes I feel sad at the thought of all the wonders that have gone before us that we’ll never know of because they didn’t win the preservation lottery. Immediately after posting, I recalled it was Leo Vroman. Well, I didn’t feel sad … until I read that. On a more positive note, Xenoposeidon has been discovered in central Canada, on a red t-shirt via Cafepress. Looks great. I’ll definitely be the only one on my block. Is there any other information on this specimen available? But one day there will be. « Xenoposeidon week, day 6: so what is a “family” anyway?